Modern Acupuncture has brought an amazing concept to life in an affordable and approachable manner for people who lead busy lives, but want to maintain a healthy lifestyle. Modern Acupuncture™, the first franchise to make the natural health and cosmetic benefits of acupuncture available to people in an accessible and affordable delivery, is now open in Bellevue. Modern Acupuncture is the fastest growing health and wellness franchise in the nation, opening locations all across the country. The Bellevue clinic is the first location to open in the state of Washington. A second clinic is slated to open in Renton later this year. Located at 60 148th Avenue SE at the Bellevue Kelsey Creek Center, Modern Acupuncture Bellevue is surrounded by many retailers such as LA Fitness, Starbucks, Greek Express, Wingstop, Wells Fargo Bank, and more. 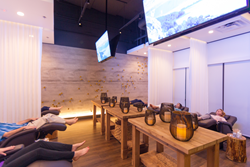 The 1,200-square-foot clinic holds nine zero-gravity acupuncture chairs inside the Zen Den, a relaxing retreat where traditional and cosmetic acupuncture is performed. "Modern Acupuncture has brought an amazing concept to life in an affordable and approachable manner for people who lead busy lives, but want to maintain a healthy lifestyle,” said Kevin Kelly, Modern Acupuncture franchisee of the Bellevue clinic. “The area of Seattle is very health and wellness-minded, which is why we felt this would be the perfect market for non-traditional health and wellness care." In celebration of its opening, Modern Acupuncture Bellevue is offering guests a complimentary first visit within the first 30 days of opening. Modern Acupuncture Bellevue is open Monday - Friday 10 a.m. to 7 p.m., Saturday - Sunday from 10 a.m. to 3 p.m. For more information or to book an appointment, please visit https://www.modernacupuncture.com/wa001 or call (425) 502-7172.